A Rocha president Markku Kostamo (left) with Vancouver lawyer and A Rocha International trustee Geoff Cowper at the Barn Raiser gala. These are exciting times for the A Rocha community in south Surrey. 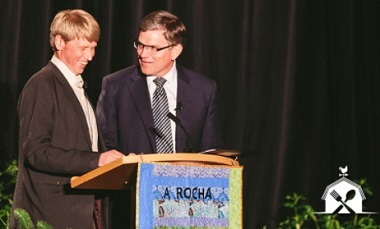 At their recent Barn Raiser gala, president Markku Kostamo announced that A Rocha is launching a $10.5 million fundraising campaign – and that they have already reached the $6.4 million mark. After years of negotiation and legal work, as of 2016 A Rocha is officially on title and legally owns both the Brooksdale Environmental Centre and the adjacent Hazelmere Cottage. So now is the time to update our 87 year old heritage buildings, add some washrooms for the 5,000 visitors we have each year, refurbish Hazelmere to become home to the internship program and renovate our heritage barn into a Conservation Learning Centre. A Rocha’s work began here in 2000 and has spread across Canada, with activity also in Manitoba and Ontario. 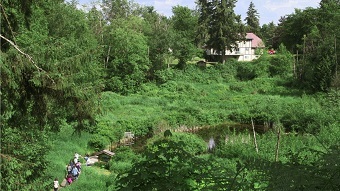 A Rocha Canada was probably the first Christian environmental centre in North America, and is part of a network of 20 A Rocha centres all over the world. In February 2016, A Rocha officially gained title of the property that is the Brooksdale Environmental Centre. 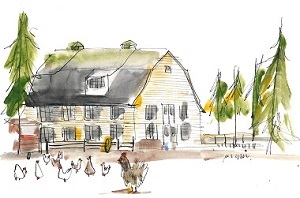 It is a $4.1 million gift from a beloved donor family. . . .
Brooksdale is a protected heritage property and includes nine buildings and a barn, situated on 17 acres of farmland, forest, river and pond that is perfect for our gardening, research and conservation work. We have been stewarding this property since 2010, and the Centre now hosts over 5,000 visitors per year, including over 2,000 kids through our environmental education programs with public and private schools. In the attached video, Brenda Neufeld tells her story of growing up on the site, and how her family decided that the property should go to A Rocha. This whole atmosphere was very healing for them, and I know it has been for others also. Ideally, we wanted some organization that was able to serve people here and to look after the land, steward the land. This combination was not easy to find. . . . This place has never been used as well as it’s being used now. In some ways it hasn’t changed at all; it’s still serving people, the gardens are still there – but it’s serving so many more people. . . .
Do watch the inspiring five-minute video. The view across Little Campbell River to Hazelmere Cottage, from Brooksdale. Brooksdale’s guesthouse looks across the Little Campbell River to a beautiful property – Hazelmere – that includes over seven acres of sensitive forest, wetland and river habitat. It also includes two acres of lawn and a large residence, built by the former owners of Brooksdale, the Neufeld family. Hazelmere was in fact once part of the bigger Brooksdale property when it operated as a care facility in the 1980s and 90s. . . . In October 2016, A Rocha took title on Hazelmere Cottage, the large house and 10 acre property on the east side of A Rocha’s stretch of the Little Campbell River. This, too, was a long discernment journey that included a few early donors pledging to donate over two-thirds of the purchase price. The property was a strategic purchase that enables us to host 15 interns at once (instead of seven), thus preparing more leaders for hands-on conservation, education and hospitality work that can ripple out to transform their home communities after they leave. Go here for more of the Hazelmere story. Barn & Hospitality Centre: to restore the 87 year old heritage barn into a learning centre and build a new adjacent food and hospitality centre – $600,000 of the $3.15 million goal has been raised. Hazelmere Cottage: to purchase the adjacent 10 acres of river and forest habitat & refurbish the 37 year old house for the internship program – $1.2 of $2.2 million raised. Brooksdale site & upgrades: to acquire the land & upgrade the 87 year old buildings for all programming, including retreats – $4.6 of $5.1 million raised. Margaret Atwood and Leah Kostamo were on a panel together at the University of Ottawa recently, taking part in The Future of Religion in Canada: Utopia or Dystopia (Restorying Canada). Photo by Peter Robb. News is good on the national stage as well. Just last weekend Leah Kostamo (co-founder and communications director of A Rocha) was featured on CBC Tapestry with Margaret Atwood. Both were in top form. Happy World Environment Day! Why not celebrate by tuning into CBC Tapestry. This audio show [Religion: Utopia or Dystopia?] . . . was recorded three weeks ago at the University of Ottawa. If you’re looking for the Christian case for hope and creation care then Leah’s talk is for you. If you’re looking to be surprised by Margaret Atwood’s sympathy for good religion then her talk is for you. Or you could listen to the whole thing as one episode and get both! I wrote more about Atwood and ‘God’s Gardeners’ here.